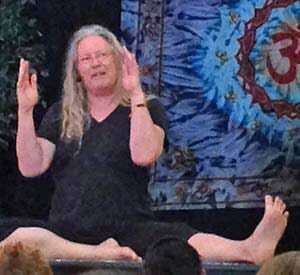 Contemporary Yoga master Erich Schiffmann spent four days with us in Sorrento BC at the conference celebrating the 20th Anniversary of SOYA. Each time I have done trainings with Erich I am astonished at the inner joy I feel and grateful for the opportunity to sit at the feet of a Yoga master and learn from the wisdom of a life dedicated to practice. Erich creates approachable and joyful ways to apply our practice to our daily lives. Erich has been my most influential teacher. Early in my “Yoga career” I was given audiotapes of his Asana practices from his home studio in Venice Beach. Several times I was struck in practicing with these tapes at the newness of each session regardless of how many times I had done it before. Since 2010 I have had the pleasure of doing some trainings with him in person and attending some of his classes. In reviewing the notes I have taken over the years from these trainings and comparing them to the notes from this year’s retreat I was amazed to see the same words written down, time after time, year after year. During this past retreat with Erich I had the question on the tip of my tongue many times-“how do you find the inspiration to teach many of the same ideas, year after year?” What prevented me from asking is that I felt I knew the answer: Practice. Erich teaches what he practices and his practice is continuous. New nuances may be learned and applied but the reality is that what Erich is teaching with amazing contemporary clarity, whether he realizes it or not, is the ancient practice of Yoga and the knowledge written down thousands of years ago that we continuously learn from. One of Erich’s primary teachings is to practice the “conscious pause” or the “Holy Instant” a term he is currently using. In practical terms this is meditation-“listening” and practicing “conscious union with infinity.” This is the essence of Yoga-realizing that we are all together in the universe and that the universe is infinite, constantly erupting in our own unique and individual ways as Beings being in the “new now” and that there is no other truth. The applicability of this to daily life is to apply the discipline of meditation to the times when we feel otherwise, when life seems difficult and overwhelming and a sense of separate self emerges. Meditate in these moments he advises-“10 zillion times a day” and ask yourself “what is the truth here really?” The truth is we are at our best in our innate state of peace and stillness. This is why we practice Yoga, whether it be through Asana (moving meditation), Pranayama (liberation of vital life force), Pratyahara (withdrawal of the senses from the external world), Dharana (single pointed focus) or Dhyana (meditation itself); the purpose is to achieve Samadhi (ultimate peace and stillness). These moments may be fleeting but with time and practice the moments become more normal and long lived. As Krishna says in the Bhagavad Gita, meditation allows the “seeker to know the joy of eternity.” In the yoga Sutras of Patanjali the practice of meditation allows us to free ourselves from our egoism so that we can become aware of our interdependence and that practice is “any intentional re-patterning of feeling and thoughts towards “interdependence.” Interdependence is recognizing the reality that we are one infinite mind looking at itself from within, each as individuals. The truth of this reality is acceptance and from that space love for self can emerge and as a logical extension, love for the people around us. In the 200 hr teacher training offered by SOYA, students are immersed in these ancient texts of Yoga; the Sutras and the Bhagavad Gita. The intention is for students to be grounded in the philosophy of the practice, to understand that it is a practice about much more than Asana. It is a practice devoted to self-realization and finding inner peace and stillness. What Erich demonstrates as a teacher and Yogi is that the ancient philosophy is easily applicable in our contemporary lives, that it is a matter of devoted practice, to find the simplicity in the reality of the universe and to find love and joy in each moment that comes across our paths. 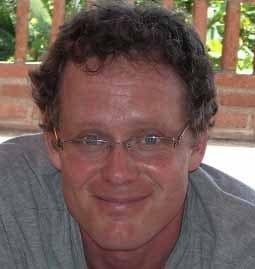 Jeff Lutes lives in Prince George, BC and is a co-owner of Chinook Yoga Studio, a long-standing host of the SOYA Yoga Teacher Training.